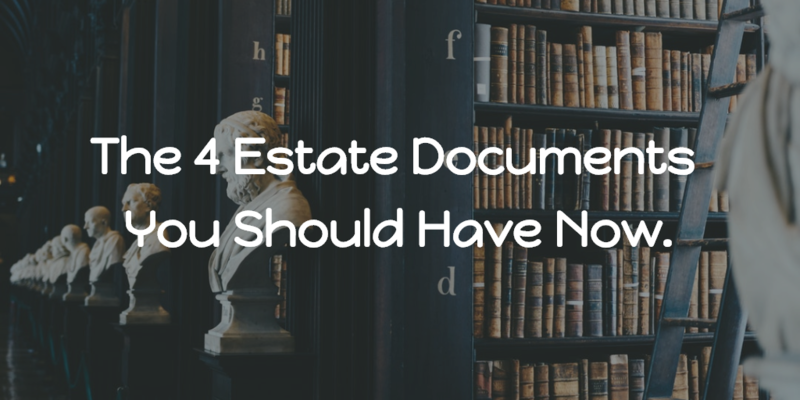 The Four Estate Documents You Should Have Now. Whether you’re 18 or 78, we include estate planning in every WealthKeel plan. Now at 78, estate planning should be a no-brainer, but you would be shocked on how many have neglected to complete these essential documents because they thought they were only for the wealthy or procrastinated for 60 years. The majority of Americans (64% from rocketlawyer.com) still don’t have a will. Even some of the wealthiest and most famous individuals neglected completing these documents: Jimi Hendrix, Pablo Picasso, Sonny Bono, Michael Jackson, Steve McNair and Abraham Lincoln to name a few. In their defense, it is never exciting to pay an attorney to plan how to distribute your assets once you’re dead, or layout what to do or not to do with your body if you are incapacitated. We recommend four essential estate documents to all of our clients: Will, Living Will, Health Care Power of Attorney and Financial Power of Attorney. If you have minor children, you should also name guardians as part of your essential estate documents. Let me provide the clear disclosure: Seek advice from a legal professional for your particular situation, and for all of the documents we are going to review. Also, understand that each state will have specifics to each of the documents. This blog is not a how-to on drafting your estate documents, it is meant to give you a basic understand of a few essential legal documents. I am a financial planner, not an estate attorney. I would have failed miserably at law school. Great, now what do these documents do? The fancy term is, “last will and testament.” Most of you have probably heard of this but never completed it based on our stats from above. Your will is also where you would name guardians for your minor children. The primary purpose of this document is to outline who will receive your assets after your death. You will also designate an executor to oversee/carry out your instructions. Without a will, your assets will have to proceed through probate which could cost money and time, and at the end of it, a judge will decide how your assets are distributed. I don’t know about you, but that does not sound like an ideal situation. A will allows you to lay out your plan for your assets. Here is where estate planning becomes vital for everyone at every age. A living will would provide guidance for your loved ones regarding your preferences for end-of-life medical treatments, assuming you can’t communicate or are incapacitated. A living will is not a fun document to complete because you are going to lay out details/instructions for life-prolonging treatments, life support, feeding tubes and do-not-resuscitate orders. Completing your living will is an unselfish act, imagine how hard it would be for your spouse, parent or children having to make these types of decisions for you. With a living will, you provide your family with your wishes so that they don’t have to guess between life or death. Make sure your primary doctor and family members can access this document quickly and easily. We ask our clients for a copy and tell them to notify their family that we have a copy, and it can be sent when needed anywhere at a moment’s notice. Durable Financial Power of Attorney. This is also referred to as a financial power of attorney. Simply put a power of attorney grants another person the ability to make financial decisions if you become incapacitated. A financial power of attorney can include everything from paying your bills to calling to liquidate your investments. Here is a list of traditional authorities with a durable power of attorney. Make sure you give this some thought because whoever you name as financial power of attorney will have full control of your financial life if you are incapacitated. Durable Health Care Power of Attorney. Take all the information from the financial power of attorney, but instead of financial decisions, they are now medical decisions while you are incapacitated. Again, make sure your primary doctor and family members can access this document quickly and easily. A health care power of attorney allows someone else to make health care decisions for you while a living will delineates your wishes. We call those the four essentials because every person should consider these documents no matter what! Estate planning can get much more in-depth with net worth, but those four documents are needed for everyone even if your net worth is $0 (or negative, thanks student loans…). We recommend all of our clients have these documents completed via an attorney, preferably an estate attorney. I know you think you can write your will on a napkin at Chick-fil-A, and as long as you sign it with honey mustard it’s legit, but you are walking a fine line. Even the low-cost online options are failing in some courtrooms across the US. You won’t realize how important these documents are until you are incapacitated or deceased. Take the time and money to do it right with an attorney, saving a couple of bucks won’t mean anything if your estate documents are not legit. Ask your family and friends for a referral for an estate attorney, and don’t be scared to shop around. You should be able to call and ask for a flat rate fee to complete those four documents. We can recommend attorneys that vary is cost depending on your estate’s complexity. Drafting the proper estate plan is easier than you think. Stop procrastinating and get these documents completed! Don’t wait until it is too late. Once finished, make sure you stay up to date. Every 3- 5 years would be a good time to review and contact your attorney to confirm no significant legal changes have occurred since the last draft was completed. Any major life events (marriage, divorce, kids, etc.) or major financial events (new home, sold a business, retirement, etc.) are good reasons to review your estate documents. As always, thanks for reading! Questions and comments can always be emailed to us. That would be a great time to ask any specifics on the items above or any other questions you have!